It goes without saying that Marine operations in Afghanistan get some pretty interesting names. There’s Operation Khanjar, the 2009 offensive in Helmand province that seized several districts south of Camp Leatherneck, including Khanashin, Nawa and Garmser. It meant “dagger” in Pashto, an imposing message. The operation was commonly called Strike the Sword in English. There’s Operation Khareh Cobra, the 2009 offensive to seize control of Helmand’s Now Zad Valley from insurgents. The operation was known as “Cobra’s Anger,” in English, which still sounds like the title to a “G.I. Joe” episode. And there’s Operation Moshtarak, the 2010 offensive in Helmand that seized Marjah, a collective of farming villages in Nad Ali and Lashkar Gah districts. It meant “together,” in Dari, a concerted effort to note Afghan forces were involved in the assault. 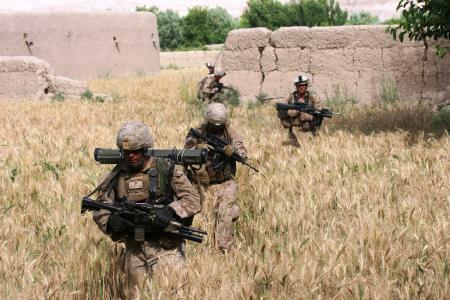 Now comes word that 1st Battalion, 5th Marines, out of Camp Pendleton, Calif., has launched Operation Zapoonki Guzaroona in volatile Sangin district. In official accounts so far, the Corps hasn’t said what the phrase mean, but we’ll pass it on when we find out. The operation itself sounds significant — and dangerous. Marine officials said Bravo Company 1/5 cleared more than 250 compounds north of the battalion’s area of operations to push insurgents away. They have exploited the boundary between the company and 2nd Reconnaissance Battalion, which is based to the north of Sangin district. God be with my nephew and the other brave hearts of Bravo Company. The 1/5 will get the job done!! So proud of my husband and his fellow 1/5 Marines. Always working hard to come home. Always loved and always missed OOOORAH!! Proud that my son is a part of 1/5. Semper Fi. This news Blog is outstanding. It is the only way I can keep up with 1/5. My son is in B Co 1st Platoon and is the Platoon Leader. Their lives have been a living hell for the past 4 weeks. I do not hear from him much due to his job and where they are. I can only keep praying for them all and pray that october will come quickly. Keep up the good work on the reporting.